Located in Dazhi in the Zhongshan district of Taipei, the Miramar Entertainment Park is a gigantic shopping mall. 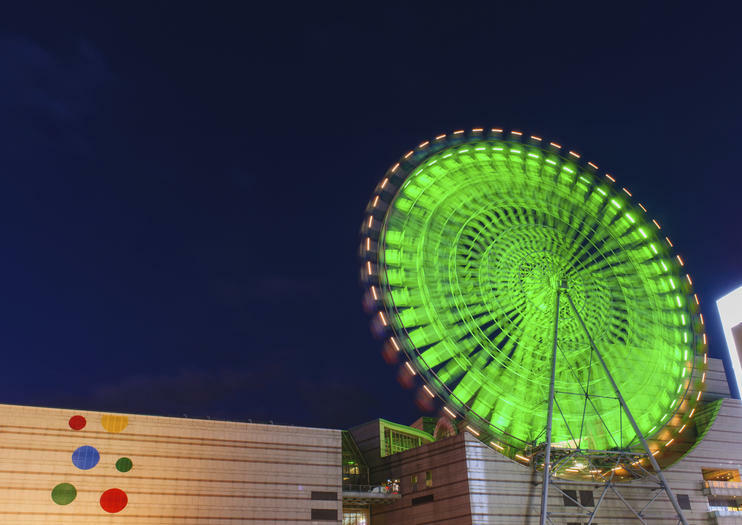 The most distinguishing feature of this huge complex is the giant Ferris wheel that sits on its roof. The mall is also home to an IMAX theatre, featuring what is said to be the largest movie screen in Asia. With its movie theaters, restaurants, and the usual fashion outlets you’d expect from a shopping mall of this scale, the Miramar Entertainment Park is a popular spot for both locals and international visitors to spend some time (and money!). It is of course the giant Ferris wheel on its rooftop that has made this shopping complex a Taipei landmark though. With 48 carriages carrying up to 288 passengers at any one time, a spin on the wheel here provides some stunning views of the cityscape. The wheel even illuminates with an impressive neon-light show come nightfall. To reach the Miramar Entertainment Park, alight at Jiannan Road Station (served by the Neihu line). The shopping complex is located right next door.